I have collections of the once upon a time thought of as perfect examples of child-rearing. Not just two or three sets but shelves of volumes numbered I-X of vintage parenting books filled with Teach-You-A-Lesson-Today- Child. Stories that will make you sh*t your pants with fright if you're a kid. 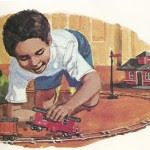 Enticing illustrations set you up, and then before you know it you're assaulted with the 1950's era finger wagging if you do this, my child, you might just lose an eye or finger or be lost forever on a nature trail. Though the titles were couched in "Suzy's Sunday" or "Johny Makes Jam" these stories might as well all been called "Here's What Will Happen To You If'n You Don't Behave." I showcase these volumes front and center in the kid’s reading room downstairs. They’re harmless fun and give us all a good laugh. Our house has a big kid in it, a teenager. He babysits for his younger brothers. One of these vintage books has a story in it about Joey, the little boy you see pictured above. Joey has a behavior problem, as children do. Joey likes to sneak around and satisfy his curiosity when no ones around. Teen: "That's not jelly on Joey, either." Free is free when it doesn't cost you anything. Free is expensive when it comes with therapy bills for a little boy who would hide the jars of raspberry jam in the cupboard because the sight of them had him out cold on the kitchen floor. Suddenly the $8 an hour for a non-free babysitter didn't seem so outrageous. 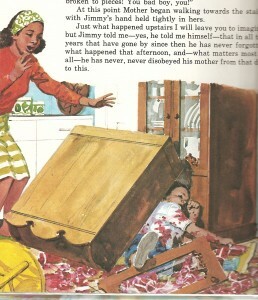 I could've used that cautionary tale on free babysitting in my vintage collection.